Directed with immense flair and virtuosity by veteran Enzo G. Castellari (who channels Sam Peckinpah and Sergio Leone in equal measure), Keoma is an epic film of Shakespearean and biblical allusions, which boasts compelling performances and thrilling violent action. 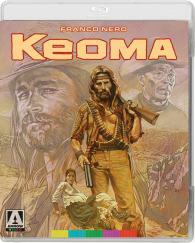 Truly epic in scope, Keoma is considered by many to be one of the greatest spaghetti westerns. The film is presented here in a stunning new restoration with a wealth of informative and entertaining new extras.